Peering through the control room glass into the studio, a cloud of smoke rises from Sister Bobbie Nelson’s Bosendorfer grand piano. After four hours of non-stop recording with baby brother Willie, perhaps she has ignited the keys during this marathon session??? Listening back to “I Never Cared for You,” the interplay between Bobbie and Will on the instrumental intro “Ou-es tu, mon amour” sets the mood perfectly for the darkness the song portrays. “Nuages,” a song written by French Gypsy jazz guitarist Django Reinhardt, showcases Willie’s dexterity and guitar genius. Whenever we are just sitting around the bus, Willie will pick up a guitar and start playing. Like the horse heading to the barn, he always gets around to “Nuages.” It’s good mendicine for him. And on this take, Bobbie’s piano provides the support that makes their performances seem effortless. In the beautiful hill country near Austin, Texas you’ll find Willie’s Pedernales studio. Willie and Bobbie are set up in the main room which is L-shaped and doesn’t allow direct eye contact during recording. Without much discussion of an arrangement, Bobbie started playing and Willie began singing “Mona Lisa.” That was the beginning of another magical session. Recording engineer Steve Chadie and Willie’s friend and producer, Buddy Cannon were at the controls as it all happened. It’s kind of like photographing a ghost; you don’t really see it till the picture is fully developed. Throughout these sessions Bobbie and Willie played continuously and seemed to never run out of song ideas — which is a producer’s dream (or nightmare). Eventually songs had to be picked for the final selections. With so many outstanding performances to choose from. I’m glad I wasn’t a part of that process. As long as I can remember. Willie and Bobbie, who ride together on Willie’s bus, spend some of their traveling time jamming on their favorite songs. Bobbie has a travels size keyboard on the bus and Willie’s guitar, Trigger, is always by his side. This is where the idea for DECEMBER DAY was born. “Why not record our favorite songs like we play them for ourselves?” Bobbie asked. In 2010 after ending a tour in Austin, Texas, the band, made up of Paul and Billy English, Bee Spears and myself, went in the studio to record with Bobbie and Willie. The song “What’ll I do” is especially bittersweet because of the passing of Bee Speers. Bee was Willie’s bass player for more than four decades and this was the last recording session he played with us. He is missed by us all. In 2012 while recording songs for the record LET’S FACE THE MUSIC AND DANCE, we would stray from the song list every once in a while. Willie might call out a song title or Bobbie might have a suggestion and this was the fun part of recording with these guys. You didn’t know where the music was going next. “Alexander’s Ragtime Band” was born from such a diversion. We are all fans of the Irving Berlin songbook and of the Ray Charles version, so this was a perfect tribute to both. In 2004, another impromptu visit to the studio resulted in three songs penned by Willie. “Walkin'” is truly a classic. Originally heard in the concept album PHASES AND STAGES, this version goes right to the heart. Willie’s guitar solo hits you like a gunshot at the O.K. Corral. If through is the question, then Bobbie is the answer as nothing rings more true than her piano. “Laws of Nature” is an “a-ha” moment. Willie writes like he’s talking to you face-to-face. Bobbie provides the soundtrack for that conversation. It’s easy to make records with these guys. You just have to listen… and then react from the heart. It’s pretty primal. The song “Amnesia” rounded out those sessions but honestly, I can’t remember anything about it. Raised by their grandparents in Abbott, a small farming community north of Waco, Texas, Willie and Bobbie began a musical odyssey that has continued for over 70 years. Daddy Nelson taught Willie how to play guitar when he was seven, and momma Nelson taught sister Bobbie the piano when she was nine. Sundays were spent playing at the Abbott Methodist church and gave Bobbie and Willie the spiritual foundation that still can be found in their music. 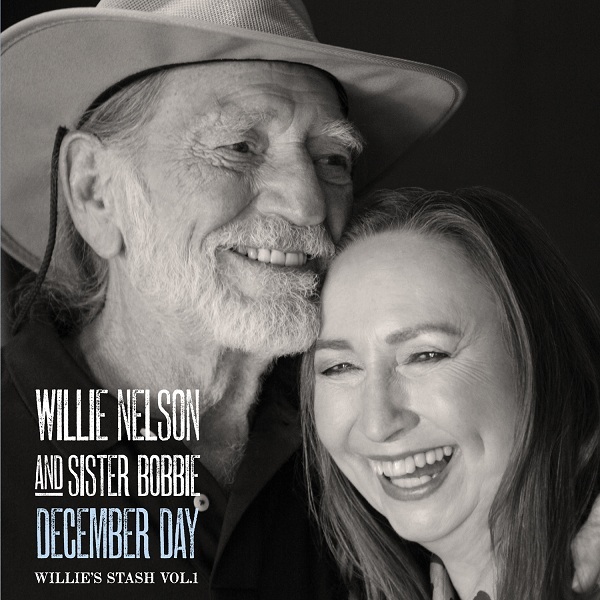 When it comes to a brother-sister collaboration with the longevity of Willie and Bobbie, there is beauty in keeping things simple, “Less is more” is the underlying theme. We’ve heard these songs before but not like this. The spontaneity born out of familiarity is what this record, DECEMBER DAY is all about. It’s not rocket science. It’s alchemy. 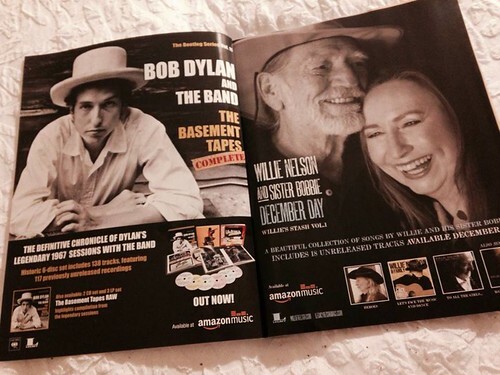 This entry was posted on Wednesday, April 8th, 2015 at 9:46 am and is filed under Albums, Bobbie Nelson, Duets and collaborations, Mickey Raphael, vinyl. You can follow any responses to this entry through the RSS 2.0 feed. You can leave a response, or trackback from your own site.